I am not sure why the low ratings of this novel on Goodreads and Amazon. Is it because of the writing, which I think is not bad at all or is it because of the main character who is simply annoying? The undercurrent of attraction in the story is elegant and subtle, and yet we sense by the end the interest that Okenwa has in Raphael, and it snaps the beginning of the story into place. How do you go about constructing a story such that the ending reveals something about the beginning? Are there stories or novels you particularly like that you think do this well? I am drawn as a reader to stories of childhood told in an adult voice, stories full of the melancholy beauty of retrospect. I am interested in the regrets we carry from our childhoods, in the idea of “what if” and “if only.” A novel I love, “The Go-Between,” by L. P. Hartley, does this very well. I’m also drawn to brave endings that stun you and make you reconsider the beginning, and I’ve just read the recent novel “Hausfrau,” which does that very well. I think of Okenwa’s attraction to Raphael as a certain kind of first love, childhood first love, that early confusing emotional pull, that thing filled with an exquisite uncertainty because it does not know itself and cannot even name itself. I decided to read Hausfrau after reading her interview, the truth is that the ending of this novel is neither brave nor stunning nor does it make me reconsider the beginning. Anna is annoying from the very beginning, so I am not amazed the way she ends up. I do not understand why Adichie says that the ending of this novel is brave, there is absolutely nothing brave about it. One of the reasons why I enjoyed this novel is because I am a psychology student and I somewhat find it interesting being in the head of an emotional depressed person and present during their psychoanalysis sessions which I think Essbaum captures so well. 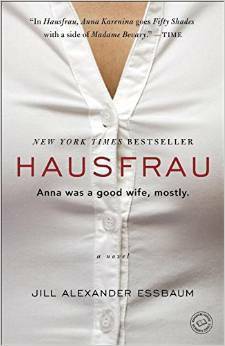 Hausfrau is the German word for "Housewife", Anna is an American woman who moves to Switzerland with her Swiss husband, refuses to integrate in their culture. She does not even have a bank account, she simply lives on the margins of society. She losses her sense of being and only finds comfort in sexual encounters with strangers. It's a novel I enjoyed. Adults only.